More than the lights, the presents or the tree, Christmas for Italian Americans means food. And no meal is more synonymous with the holiday than the Feast of the Seven Fish (or Seven Fishes, as it’s known colloquially). Widely believed to have started in southern Italy, the feast consists of seven seafood-based dishes traditionally served on Christmas Eve before midnight mass. It’s generally thought to have risen from the Catholic practice of forgoing meat on Fridays, but the significance of the number seven remains the subject of debate. Popular theories include the fact that seven is the most used number in the Bible (appearing more than 700 times), a reference to the Seven Hills of Rome, the seven Sacraments, and/or the seventh day of creation when God rested. Even if you don’t plan to attend midnight mass, or celebrate the holiday at all, the Feast of the Seven Fish can inspire a festive dinner party that your guests will remember all year. A few hors d’oeuvres served with cold bubbly is a great way to greet your guests. Smoked oysters, lox on toast, fried calamari and/or caviar are all great options. Or check out these easy appetizer recipes. Soak anchovies in water for one hour. Drain, rinse and chop. 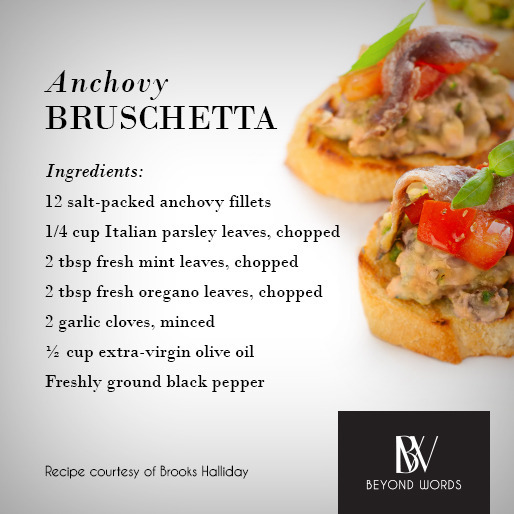 Preheat the oven to 375 degrees F. With a fork mash together anchovies, herbs, garlic, oil and pepper until creamy. Spread mixture over slices of baguette and bake until toasted, about 8 minutes. Arrange clams on a baking sheet and broil until they open, about 5 minutes. Collect any juices in a measuring cup. Remove and discard top shells. Run a spoon underneath each clam to loosen it from the bottom shell. Distribute the reserved clam juice among the clams. Sauté bell pepper, shallot and garlic until fragrant, about 5 minutes. Add wine and cook until liquid is reduced by half.. Remove from heat and stir in the breadcrumbs, cheese, parsley, and black pepper. Spoon breadcrumb mixture onto each clam. Broil clams until topping is just browned, about 5 minutes. Top each clam with crumbled bacon and serve with lemon wedges. Preheat oven to 425 degrees F. Slice prosciutto into thin strips, about 1 inch wide and 3 inches long. 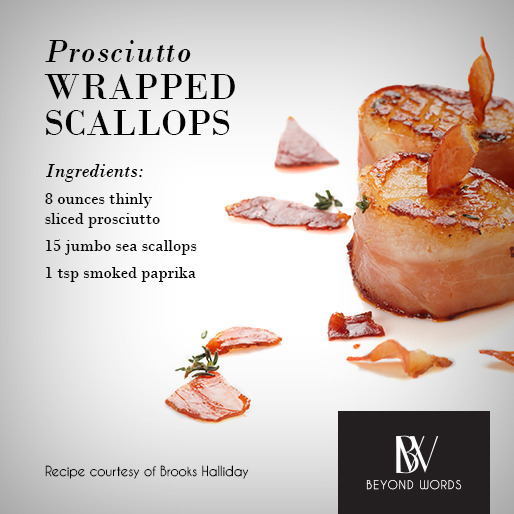 Wrap each scallop with 1 strip of prosciutto and secure with a toothpick. Lightly sprinkle each scallop with smoked paprika on both sides. Transfer to a baking sheet. Bake scallops for 8 minutes. Flip and bake for an additional 8 minutes. When it’s time to begin the seated portion of the meal, soup is a great choice to warm the belly without being too filling. Manhattan clam chowder, cioppino (shellfish soup), or Billi Bi (cream of mussel soup) are all delicious options. Or give your guests a spoonful of the unexpected with this crab and butternut squash bisque. In a large stockpot, combine butter and 1 TB olive oil. Sauté onion, carrot, celery, garlic and squash until fragrant; season with salt and pepper. Add stock, bring to a boil and reduce to simmer. Cover and cook until squash is tender, about 30 minutes. Remove pot from heat. Add cream and puree soup until completely smooth using an immersion blender or transferring in batches to a stand blender. Allow to cool slightly. Meanwhile, in a small skillet over medium-high heat, add olive oil. Once the oil is hot, add whole sage leaves and fry until crisp, about 10 seconds. Transfer to a plate lined with a paper towel. Fold crabmeat and chopped sage into soup. Season to taste with salt and pepper. Ladle into bowls and serve garnished with crispy sage leaves. 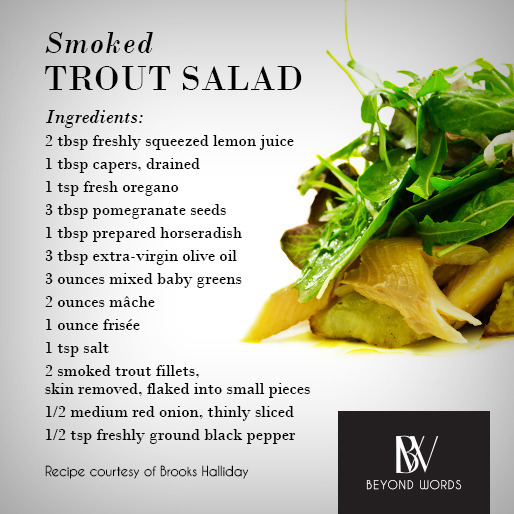 With multiple courses to go, a light green salad with smoked fish will keep your guests from getting too full. The possibilities are endless. Just stick with delicate lettuces like mesclun, mâche or watercress to compliment the texture of the fish. A citrus-based dressing, like the caper horseradish vinaigrette below, is a natural flavor pairing. In a small bowl combine lemon juice, capers, oregano and horseradish. Season with salt and pepper. Whisk in the olive oil until emulsified. In a large bowl, toss lettuces and onion with dressing, reserving 1 tablespoon. Top salad with pomegranate seeds and smoked trout. Drizzle salad with remaining dressing and season with freshly ground black pepper. What’s an Italian meal without pasta? Linguine with clams is an obvious (and awesome) choice here. Or try this mouthwatering shrimp and lobster ravioli. Store-bought wonton wrappers are a timesaving shortcut that works beautifully in this dish. Bring a large pot of salted water to a boil. Boil lobster tails for 8 minutes. Remove meat, reserving shells, and chop into 1/2-inch pieces. Set aside in refrigerator. Add lobster shells, reserved shrimp shells, vegetable oil and tomato paste and cook over moderate heat, stirring, until sizzling and the shrimp shells turn pink, about 5 minutes. Add white wine and bring to a boil. Add water, carrot, celery and onion and bring to a boil. Cook over moderate heat until the broth is reduced to 4 cups, about 1 hour. Strain the broth into a saucepan and boil until reduced to 2 cups, about 10 minutes. Meanwhile, in a food processor, puree half of the peeled shrimp with the heavy cream. Finely chop remaining shrimp and stir into the puree. Transfer to a bowl and stir in lobster meat and chives. Season with salt and pepper. Lightly brush the edges of each wonton wrapper with water, keeping wrappers covered in plastic when not working with them. Spoon a teaspoon of the seafood filling into the center of each wrapper. Fold the wrappers in half over the filling to form triangles and press tightly to seal. Transfer the ravioli to a baking sheet lined with plastic wrap. Cover loosely with a towel and repeat until you run out of filling. Melt 1 tablespoon of the butter in a large skillet. Add the tomatoes and cook over high heat, shaking the pan until they begin to burst, about 2 minutes. Add the reduced lobster broth and cook over moderate heat until slightly thickened, about 8 minutes. Swirl in the remaining 3 tablespoons of butter and season with salt and pepper. Keep warm over very low heat. In a large pot of boiling salted water, cook all of the ravioli just until they float, about 1 minute. Drain the ravioli and add to the sauce. Cook over moderate heat, turning occasionally, for 3 minutes. Ladle ravioli and sauce into bowls and serve garnished with parsley and cheese. When it’s time to serve the main course, why not go for a little drama? Whole steamed lobster with drawn butter is a classic (but pricey) choice. Equally spectacular but easier on the wallet is whole roasted fish. Served up family-style with everyone picking off of a large platter, this dish feels intimate and informal. The freshness of the fish is paramount; get to know your fishmonger. With a little advance notice, he or she can likely guarantee a fresh catch and set it aside for you. Score skin of each fish with 3 diagonal cuts. Rub inside flesh of each fish with 2 1/2 teaspoons olive oil; drizzle each fish with 4 1/2 teaspoons lemon juice. Sprinkle flesh evenly with salt and black pepper. Place both fish on a rimmed baking sheet coated with cooking spray. Place 3 tablespoons onion, 1 tablespoon fennel, 2 rosemary sprigs, and 2 oregano sprigs inside each fish. Rub skin of each fish with 1/2 teaspoon remaining oil; drizzle each with remaining lemon juice. Roast at 400 degrees F for 30 minutes. Transfer fish to a large serving platter. Serve whole, drizzled with olive oil and sprinkled with smoked salt.